Good Times of Olean, 1 Leisure Lane, Olean, New York, offers 42,000 square feet of entertainment for all ages. 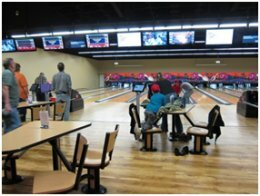 You can enjoy the modern 16-lane bowling center, the 18- hole miniature golf course, pool tables, darts, card tables, shuffle boards, beach volleyball courts, and batting cages for baseball and softball. The enormous outdoor patio on the first and second floors offers plenty of space for groups and parties. Restaurants on site provide a wide choice of dining experiences. The Hammer Back Bar & Grill is perfect for family dining, girls night out or drinks with the guys, the Snak Shak offers all the kids’ favorites at reasonable prices, and for date night, why not enjoy a delicious steak or fresh seafood entrée at The Point.